Side step to convenience! 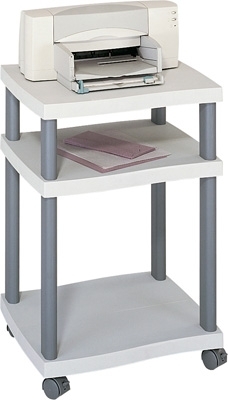 Quick setup, easy storage and utilitarian design are perfect for your office. This convenient machine stand is just the right height to keep a printer or fax machine within easy reach of your desk or workstation. Complete with clean, contemporary design in durable plastic, a machine platform and two supply shelves that provide storage for paper, ink cartridges, envelopes and more. Rolls easily to point of use on four swivel casters (2 locking).